Now we have Opposition Parties doing what they are supposed to do. Peaceful protests are meant to act as checkson the Government. It is part of the process of Multipartism; and in line with the rule of law. The Police should do justice and let the Opposing Parties express themselves as it is their Constitutional privilege. Kambwili now displacing gbm. Just look at the sitting arrangement. Back to topic. We never saw kambwili refusing salary hike and ministers allowances when he was minister. What has changed now. Well, if it is true that these salary increments we’re done outside of mandated channels, then CK and HH have a point. We can’t keep spending like drunken sailors. On the other hand, I wouldn’t be surprised to later learn that this actually was approved by parliament and Kambwili just absconded the vote. I would understand HH being misled because he doesn’t seat in Parliament. But with Kambwili, these are the issues he should be “pounding the table” about in the people’s houses. That’s what people expect and the reason he was elected MP. Not wasting people’s time staging public demonstrations when they could be engaged in other productive activities that add value to their lives and the economy at large. The same CK never raised a finger when MPs’ salaries were raised not too long ago. This is the kind of hypocrisy that discourages a lot of citizens in Zambia. Even UPND/HH never says a word when their MPs in Parliament get salary/allowance increments too…..so where are your PRINCIPALS here? If these increments are STATUTORILY MANDATED, what are Street protests going to achieve? So Kambwili, get back to Parliament and sponsor a BILL to change this…. for both MPs and Cabinet Official/Ministers. That’s where you should be fighting. Not grandstanding on the streets in the name of fighting for the people….people sent you to Parliament for a reason! @Oval, why do you think Kambwili and Kalaba not in PF any longer? Why you think Inonge is being insulted by state house? HH needs to sit down. He got his wealth through under-valuation of Zambian assets during privatization there by contributing to the plight Zambians find themselves in. And because that money was ill gotten, he hid it in tax havens. HH is as crooked as they come. Thing 1 and Thing 2 aka GBM and CK aka UPND Bemba mascots are just as corrupt. Stop wasting our time! Next time you will hear that Kambwili , HH GBM have been charged for unlawful assembly by Kanganja who allows Jarabos to demonstrate in an uncontrolled and dangerous manner . Whilst they are still at it, let them also protest the salary increment for members of parliament, oh wait CK and UPND MPs cant protest because they are benefiting from the increase. Hypocrites! HH has continued to partner with South Africans ti swindle Zambians. Look at how much money laundering going on at Sanlam Life Insurance and Africa Life (Saturnia Regina). Billions transferred to Sanlam camouflaged as reinsurance premiums. @Yambayamba – these salary increments are not a secret the SI are there to see …this was published by ZWD 4 months ago….I wonder why these guys are reacting now. Someone must do protests over illegal money laundering activities by HAKAINDE CHILDISH. Dept of HATRIBES HANEGAITVES HaMWEETWA HaTONGA resistance for non-TONGAs. HAZALUZA HAGAIN. To make matters worse these people have not paid other govt institutions in the name of govt has no funds. you can wonder if they do have a conscious. Let that question be written by Pro. HANSONI on a Univeristy Letterhead. I will answer for you. He says he is on a no fat no sugar and water diet prepared by his wife…if only BUFFOON CK could take notes as he has butter even on sick bed. Who is a public servant. If these guys can have very little differences in there salaries then we would have a middle class and poverty free country but with a difference of more than 50 000 in salary we are doomed. Checks and balances need to be seen. Just because it is Cabinet Ministers they protest because they have a few or no Cabinet Ministers in UPND. When increments were given to MPs there was no protest because UPND has MPs and they knew their monitory contribution to the party will grow. Either way its a waste of resources when they claim to be adopting austerity measures. Lungu and his people have failed it’s clear you don’t need to be told. Peaceful protests a must that’s truly selfishness on those salary increments at least not at this time. Do you advise each other or muvichitilamo Chee? PF is greedy losers they’re not in power yo serve the people but to enrich themselves on the backs of poor taxpayers. Very interesting spectacle and sad if it’s proven to be true. I would like this protest to be extended to members of parliament as well. The increment from my understanding included parliament were CK and HH MPS are drawing hefty salaries. LT has given us one sided report about “illegal” salary increase, what did cabinet office say about it? This is called balanced reporting! This issue I suppose must be married together with motor vehicle conditions of service for us to appreciate the dynamics. Academician you have made my day….Am very much PF but this one awe shure…. So Academician, is this the mathematics UPND-NDC is calling 100% salary increment? HH is dull how does he protest alongside the accused. Kambwili has not paid the money he got and claimed he wrote a letter asking where to pay the money. Very childish and HH instead of asking kambwili to pay first he plans to march with him against the same chap. Total dullness on both of them. Boring from known losers (HH,CK & GBM)!! !Do you know how much the MD for Zesco,ZRA,BOZ get? K41 000 is simply nothing for the president. Atleast advise Govnt to remove so many incetives paid to senior Govnt officials and not this salary increament.MPs increased their salaries recently and HH& Kambwili kept quiet because they benefited,see!! !So give us a break please!!! Plus even if you protest,then what?You wont achieve anything because our opposition parties have no massive support in Zambia.IT WILL BE LIFE AS USUAL IN ZAMBIA BADAALA!! !Advise Govnt to reduce fuel so that all Zambians can benefit and not this nonsense!! Copy the French protestors either the current nationwide version or the one of 2ooyrs ago when they hang their greedy rulers. Zambians can do it too coz this farce needs to end. 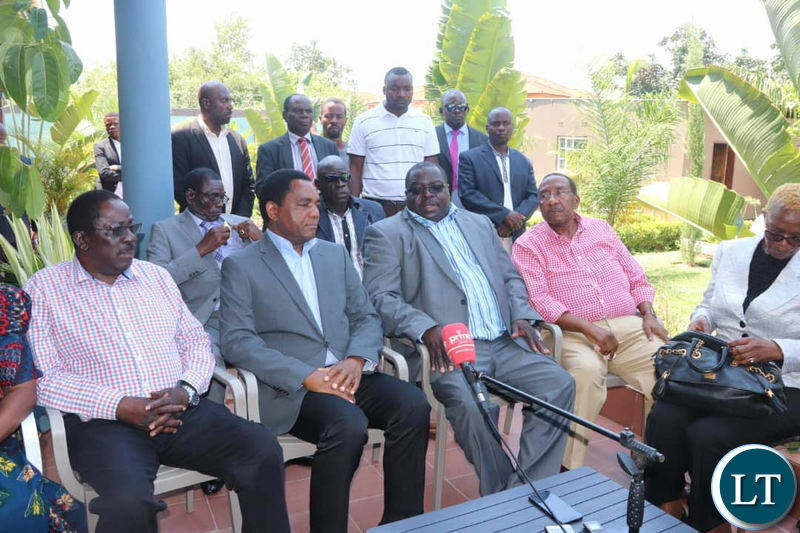 Moreover,Kambwili has never paid the money he got as a minister and HH has no shame to seat next to a culprit.This is why many of us simply cant take HH serious because he has no direction in politics!! !Kambwili told the World before 11/08/2016 that even if Jesus Christ stood on any political party than UPND in Southern,tongas can still reject the Son of God and vote for fellow tongas!! !SURELY CAN HH FORGET THIS?SHOCKING!! 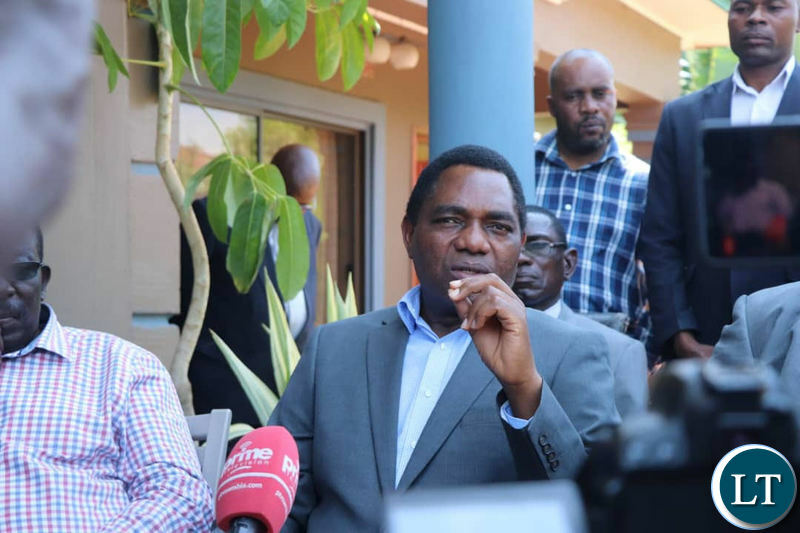 !GBM is being displaced as Veep in UPND by CK,but still that wont win HH the presidency in 2021 because majority Zambians still cant vote for HH&CK’s team!! !Kambwili’s NDC have lost all the elections terribly across Zambia since this party was formed,so WHAT HAS HH SEEN IN KAMBWILI?Indeed ECL is a winner!!! This is the kind of analysis that an opposition is supposed to make, why had HH only just seen this now? These are the checks and balances that we as the people need not mindless insults and court petitions which go no where and only waste valuable time. Please also see to it that Kambwili himself also pays back that money ministers received after dissolution of parliament he too received. The same should apply to all MPs both ruling and opposition who all benefit from this culture of excess when the majority are living in poverty. You don’t have to wait long. I am sure his mouth is already foaming as he consults Mpombo on how to string together some meaningless jargon just to sound relevant to his handlers. How did Mwamona investment get so many jobs on the cb and failed to finish. Even using forged certificate on incorporation. After he got fired he says PF is corrupt. Look at the Kalaba and am sure Zambia is watching. Uluse ba GBM,being sidelined patalipatali,there we go. Francis Kaunda,the chairman of the ZCCM negotiating team who was appointed over the heads of the ZPA Members, was also former chairman and chief executive of ZCCM. Mr Abel Mukandawira was chairman ZPA. Which tribesmen you foool? In your deliberately chosen list there are so many tribes. Why do you want to go to all fake efforts to defend crime? Life Experience _ Which one of the people you have listed are seeking the Presidency? One Zambia One Nation. Together we can Zambia great again. This mwamona investment got illegal salary from gov’t when parliament was disolved and he has refused to refund in spite of court judgement. Let mwamoma also protest against illegal minister salaries when parliament was disolved. This is what I mean when I say hh is just a desperate useless crook. If hh had any principles he wouldn’t be working with mwamona. If this gentleman thinks he can use bembas to cleanse himself from tribalism let him not hire soiled characters like mwanona and the other guy on the far end. Any member of the ZPA, or consultant to the ZPA, and their immediate families and professional partnersare are required to disclose any conflict of interest.However, this disclosure is not made publicly but to the Director of the ZPA who has total discretion in deciding what action (if any) is appropriate in each case.Those responsible for the implementation of the Privatisation Programme may not participate in the programme except through public share offerings.Political leaders and public officers are required to publicly disclose their intention to bid for shares in a State owned enterprise, except in the case of public floatation. We will all join Countrywide and show PF that they are a lone and are full of criminology. PF greedy buffoons will only listen when there are protests and riots. I will prepare my catapults. Cont…The ZCCM privatisation – by far the most important of Zambia’s parastatals – is one notable exception.Negotiations over the sale were being led by the international merchant bank, N.M. Rothschild until, at the end of March 1997, Mr. Francis Kaunda was appointed by the President, rather than by the ZPA board, to head the ZCCM Privatisation Negotiating Team. This directly breachd the act. We have researched and researched, we cant find the name HH mentioned any where for doing any wrong there. We are appealing to those falsely accusing him to kindly share the evidence to the contrary. Learn from yellow vests in France. Its not opposition political party leaders that incited protests. Yet Macaroni has yielded to public pressure and has lifted high taxes even on diesel which has high sulphur content. Our level of polymer pollution in Zambia not in red yet. We can contain it using recycling technologies while maintaining current job creation. Vegetables vendors in markets are the biggest consumer of these products . Mega chain stores can afford alternative.. But unemployed youths sale plastic to survive. Setting up a new production line for different materials takes years of planning. Its not as simple as drinking warraa. Here is an opportunity for all workers to engage and negotiate for better salaries because the politicians themselves have seen the need and there goes the hynae blocking it, my foot. Now to those who dont know HH and Kambwili, here is some clue. These are poins you project because even street illiterates will understand. If you want street protests just say no job for you because govt has banned plastic. You will Armageddon. These boys that easily riot survive on selling plastic. With 40% unemployment, poverty on the rise , lungu and his team have no shame. Other people increase their salaries for a job well done but it seems like lungu thinks a $ 17 billion debt , 40 % unemployed, stagnant GDP, falling forigne reserves is a job well done ?? CK should be last person to talk about such issues for Gods sake. He was in government when some of this thing were happening and he never said a thing. I don’t want to start imagining what he would have been saying if he was still in government. This is the same foo1 who was being used in such situations to protect the government. What has really changed now? The opposition should concentrate on organising their almost dwindling party so that maybe they could try to win it in 2031, better still there are more important things they can protest for that affect a lot of people than this. Why cant you protest over non payment of benefits to retirees? For me this is more beneficial to most Zambians . Is a retiree an outcast? Nayaa Inee!! HH, I’m getting worried of the combination you are practicing about Kambwili. Kambwili already served and is serving for the Government since MMD and PF since 2001 to date, what convincing reasons does he have for the challenges that we encounter as Zambians and is he not there too but what does he do to the situations?. Recently Kambwili himself said, Mwanawasa was a great leader even Rupiah Banda was but not this monster, Edgar Lungu, said Kambwili. Now, look at one of the references he referred to,Rupiah Banda, factually he wasn’t a great leader.I’m seeing that Kambwili is seeing that becoming a president in Zambia is easier and cheap hence he’s fighting hard and harder to get what he wants that is nothing apart from being president of Zambia. Ba hbm displaced Dr. Banda just because just because balikwata money. This is political polygamy. The guys has a wife and divorces and marries new looking wife. Pachifentelo,idibala,you insulted bamayo ba Nalumango,hh ,gbm,tongaz and how are u facing these pipo today! Ala ba kambwili mulekwatako insoni,elyo insoni ebuntu.I can profecy Saboi and many other ndc members resigning bkoz pachifentelo has no direction he is under an illusion. In 1991 and 2001 when Zambians protested against KKs one party state and FTJs third term bid, these were genuine reasons to do so. hh and ck ‘s reasons are personal and selfish borne out of bitterness, hate, greed and jealousy. That’s why the French protests are successful. If all the lies and falsehoods upmd and ECLs enemies have been peddling were genuine, you wouldn’t need ck or hh to rouse the spirit of the people as the French have shown us!! Protests in Europe are usually successful because they don’t have political connections. They are purely organized on tangible issues without hatred. Even if they protest nothing will change. Waste of time. Nice to see Masebo in the second picture. Trib.al Hacks, speaking for Zambians? Which Zambians? You have no mandate from us Zambians, maybe speak for your trib.als. Honestly Trib.al Hacks, do you expect Zambians to take you seriously? With GBM? And now with Kambwili the stink.ing corrupt thick neck? He is now your ally? Are these not bemba monkeys? Were you not insulting each other with Kambwili? Has he become your trib.al now? This boy surely knows no boundaries in his futile and stillborn efforts to enter state house!!! is a derogatory term for a person perceived as a propagandist for a cause of whose goals they are not fully aware and who is used cynically by the leaders of the cause. The term was originally used during the Cold War to describe non-communists regarded as susceptible to communist propaganda and manipulation. Are these really birds of a further? Marriage of convinnience. Just imagine if the baboon was still minister what his reaction would be. Remember how he abused the government owned media to congratulate himself after getting a Cornerstone University degree. He didn’t see it as illegal. Let others protest but not this baboon. Finally we are going to have checks and balances in Zambia. Politicians should be accountable to the people of Zambia and let us support these guys. This is not about HH or CK but Zambians. We are being taken to be fools by fools who thinks we can’t see. Mind you, these checks and balances will continue even when PF is out of power. Don’t worry even GBM will also be checked the same way when he becomes VP. CK has been squeezed in the peg hole, he is bleeding politically and economically. He now needs a hand of HH to help to survive.They think that they can destroy PF for his betterment but they are lying to each other they are just confusing each other than ever. Their combination is full of bitterness,hatred and evil.upnd they also support nonsense.good that you’re wrecking your potential 6th defeat. ““For your own information, I have written to the Secretary to the Cabinet asking him where I should pay the money, the Concourt ruled and I will pay back that money having received it when I illegally stayed in Office”, Mr. Kambwili added” Chishimba mwaiche you know where to pay the money. You where a cabinet minister, the money goes to reasury just pay and show us the receipt that is for our own information. We do not want stories. 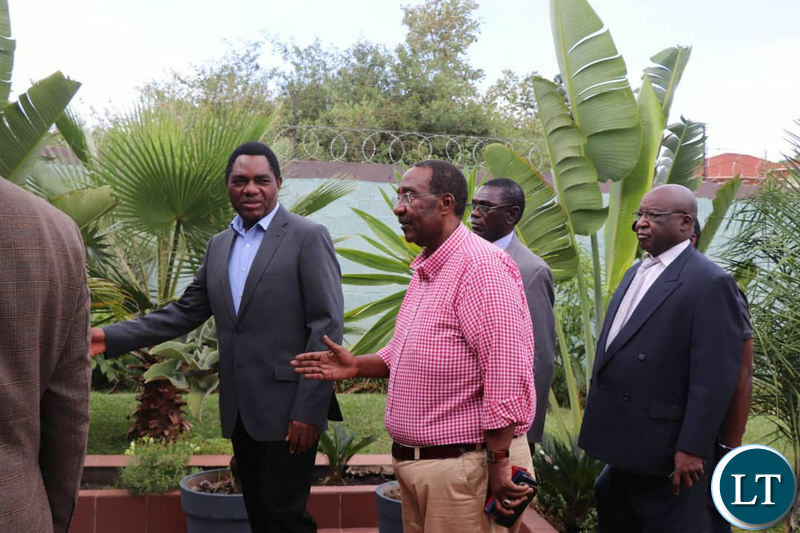 HH got his wealth through under-valuation of Zambian assets during privatization. What do you mean undervaluation of Zambian assets ? By 1991 the Zambian economy was on its feet and insolvent because nationalisation had failed to assist companies accumulate capital. In the Kaunda regime companies made only losses because there was no market system for profits. Therefore, where did the assets come from which you claim were undervalued? HH was simply paid as an insolvent practitioner.Little knowledge is dangerous and stop this privatisation spin. Is the increase by 41,000 or to K41000. Was is Mwanona investiment or Mwamoma. I Thought It’s manona, fyebatemwa ukunona. COUNTRY.PLEASE PEOPLE DON’T EVEN ARGUE.,THESE PEOPLE HAVE NOTHING TO OFFER ZAMBIANS. NANGU MULAFWAYO UKUTEKWA TEIFI. BA KAMBWILI INSONI EBUNTU. This is a serious case of mental disability by one trib.al Hacks….I don’t which clinic provides a cure for that, it’s probably incurable otherwise trib.al Hacks would have sought treatment by now. It is interesting to watch what selfishness does to human beings. GBM and CK benefited from the very misdeeds they are condemning….and they are asking for our trust. ‘Zambians have a short memory’, said Levy Patrick Mwanawasa.